Heat oven to 400 degrees, mix sweet potato, oil and garlic with salt and pepper on baking sheet. Roast for 25 mins, stirring half way. Meanwhile, boil the gnocchi according to pack instructions. With a few secs to go, throw in the spinach (if use spinach gnocchi you can leave spinach out), then drain the gnocchi and spinach together. 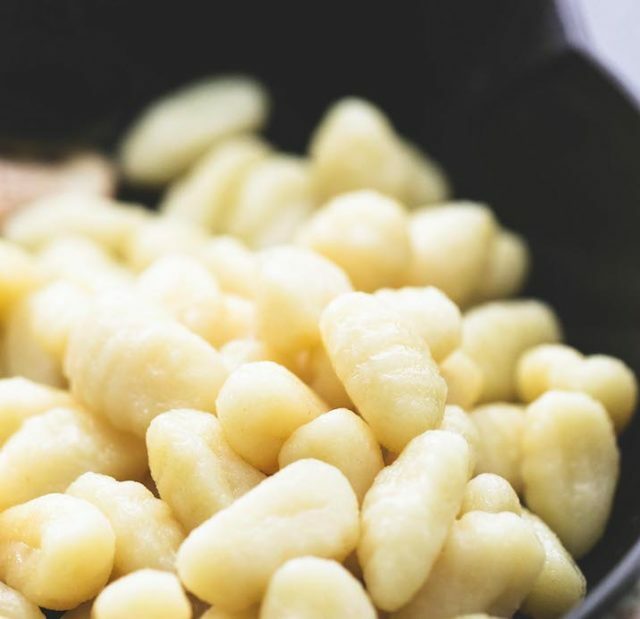 Combine sweet potato mixture and gnocchi in a serving dish or a bowl, then mix everything together well, mashing the softened garlic. Then crumble over the cheese to serve. Heat grill to high. Heat 1 tbsp olive oil in a large frying pan, then soften onion and red pepper for 5 mins. Stir in 1 garlic clove, fry for 1 min, tip in chopped tomatoes and gnocchi, then bring to a simmer. Bubble for 10-15 mins, stirring occasionally, until the gnocchi is soft and the sauce has thickened. Season, stir through a handful of torn basil leaves, then transfer to a large ovenproof dish.